The CD40 antigen is a glycosylated phosphoprotein. It is a member of the Tumor Necrosis Factor Receptor (TNFR) superfamily and contains four cysteine-rich repeats. Its molecular weight is about 44-48 kDa. 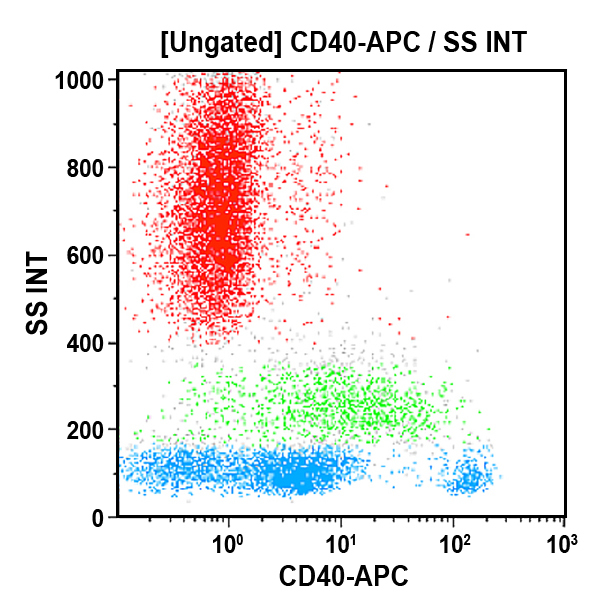 CD40 antigen is present on all mature B lymphocytes, but not on plasma cells. It is strongly expressed by interdigitating cells, some epithelial cells, follicular dendritic cells, and fibroblasts and macrophages. CD40 binds to CD154 (CD40 ligand) on T cells, resulting in B cell growth and differentiation. Clone Description Co-culture with MAB89 and IL-4 leads to long term B cell proliferation.